Alright guys, welcome to week 3 of the $100 Room Challenge!! 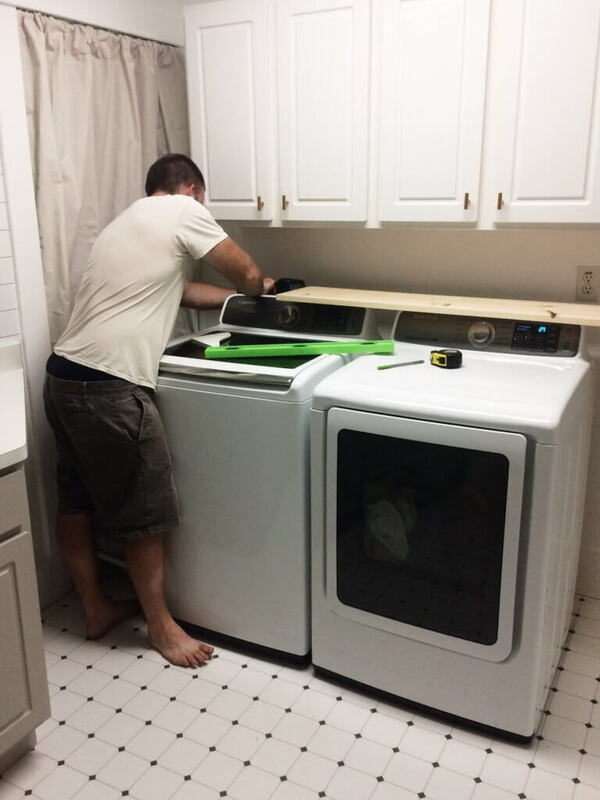 This week I’m giving you a sneak peak of our washer and dryer situation and showing you how we made a shelf to cover all of the pipes and hoses behind them. If you follow along on Instagram, I’m sure you’ve been laughing along with us as we figure this room out!! 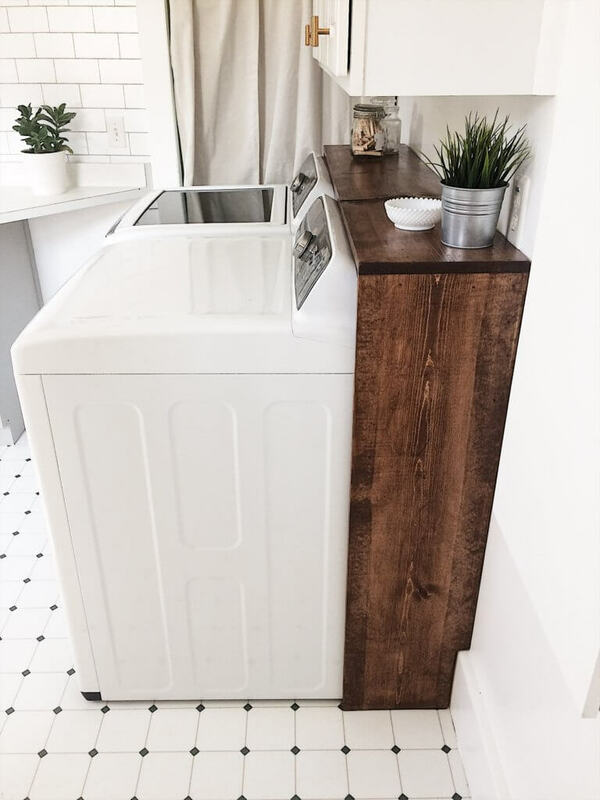 What I love most about the shelf we built is that it can be lifted off in a moment to access the water lines and everything else behind the dryer. It was a SUPER simple DIY and it cost us $12 in wood to build. I’ll be honest, I was expecting to be able to make this out of scrap wood for free, but we didn’t have quite enough in a board that would have worked. I had to trade this for the rug I wanted to buy to put in front of the washer and dryer, but ultimately, I feel like the shelf was the better choice. Are you ready to see what it looked like before we installed the shelf!? This is the sight that greeted us right when we walked into the bathroom. Yeesh. It was stressing me out, but just LOOK at what we see now! And I CANNOT get over that gold hardware!! You won’t even believe how dirt cheap it was, but it looks and feels high quality!! So much better, right?! And it is seriously the world’s easiest project to complete! 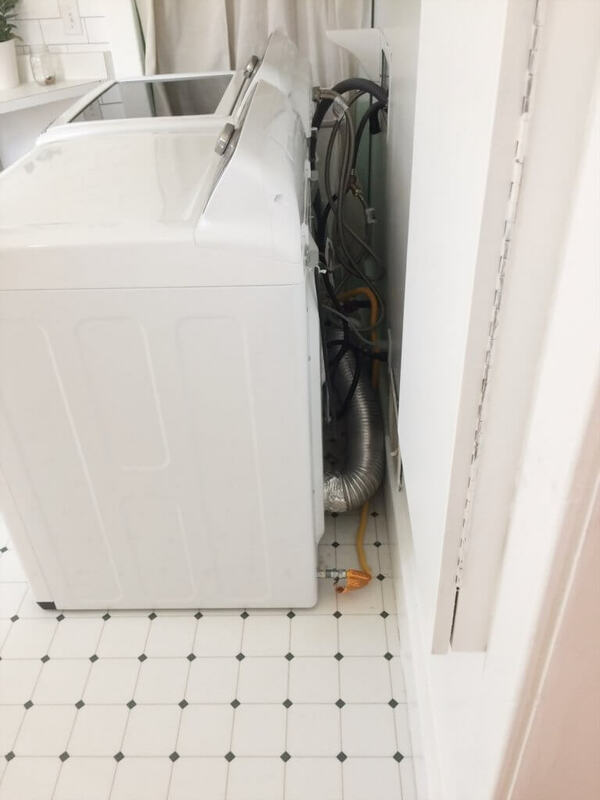 All you need to do is measure the distance from your wall to your washer and dryer. Ours ended up being a 1 foot gap, so we picked up a 1×12 board in a 1o ft length at our local hardware store. We even “splurged” for the higher quality board that cost us a grand total of $12!! Then, just measure and cut to the appropriate length. Not too shabby for $12, right? We stained the shelf in Minwax Special Walnut, which we had on hand. This is my favorite shade of stain ever, and pretty much everything in my house is stained this color! Another project we worked on this week was my subway tile backsplash under the gray cabinets. And it only cost $35. How is this possible? Wallpaper!!!! Guys, I’ll be honest. The room was coming together, but I was starting to worry that it wasn’t going to be as great as it was in my head. Then we put this Devine Colors peel and stick wallpaper up, and BOOM. Totally brought the whole space together. I was a little worried that using wallpaper to simulate tile might look a little, well, fake. But this stuff is actually textured and they did an excellent job of shading in the “grout” to look like like it had depth. I got this puppy at Target. Again, I was a little hesitant: what if it doesn’t actually re-position (it does!) or what if I can’t get the air bubbles out (I could!) and what if it’s a huge waste of money (it wasn’t!!)! The only thing: You will DEFINITELY need two people to install it. My mom and I were able to do it relatively easily together, but holy cow. Trying to do it myself would have ended in a huge disaster. 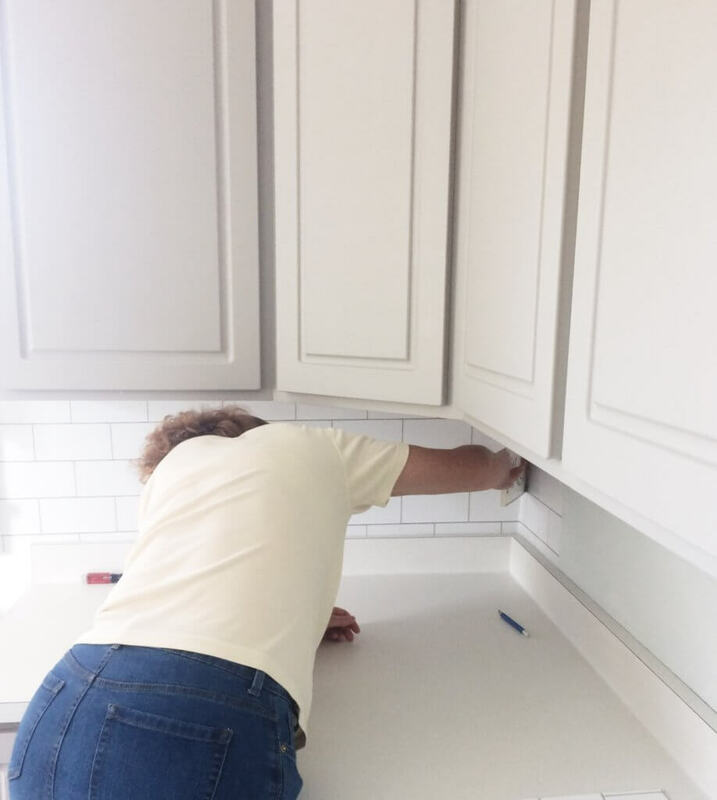 Add subway tile backsplash under cabinets-DONE! Make shelf to cover washer/dryer hoses-DONE! Hardware–I’m comin’ for you this week! Thank you so much for checking in and I can’t WAIT to see you guys next week for the big reveal!!! This post contains affiliate links. Thank you for supporting the brands I love! SO pretty! It’s seriously like a magazine. This looks great! I love the shelf idea and well, Eric Carlisle is awesome too! Ha ha. Can’t wait for the reveal next week. Good job with the shelf. That’s a clever solution, especially utilizing the bracket. this shelf is SO SMART I love it!!! The shelf looks great! And that wallpaper is so cool! 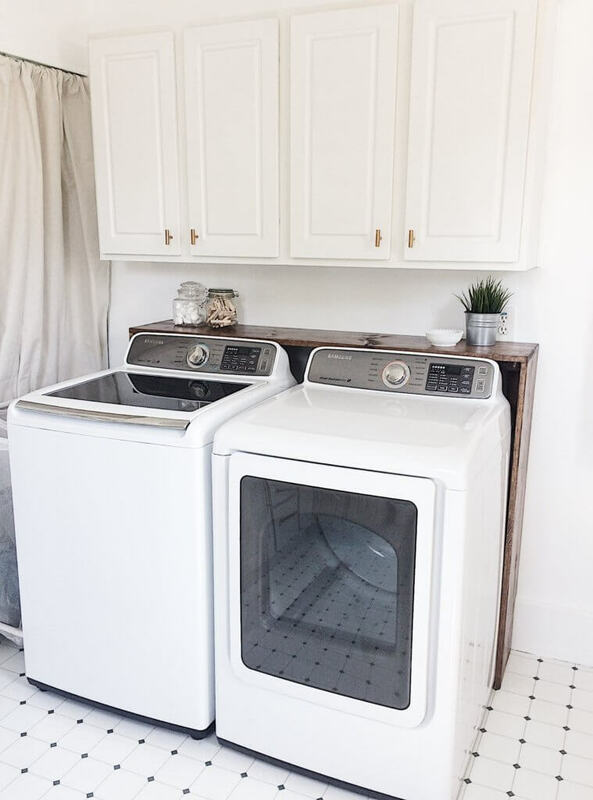 This laundry room is looking so bright and beautiful! And I love that shelf. Adding that one too my list! This is amazing!!! That shelf made all the difference in the world and who knew that wallpaper could look so good. Great job!! I LOVE the shelf! What a great use of space! I am definitely going to keep this in mind for our laundry room! The shelf looks amazing! Such a great idea to cover all those hoses! And I cannot wait to see how the tile wallpaper looks in the space! Everything is looking gorgeous, and I’m SO happy to hear that you are almost done! Yay! Wow, that subway tile wallpaper looks amazing! I love it. I am so jealous that you are almost done….I am just about the opposite! UGH! Looking great! You’re so talent, I always love the changes you make! Excited for the reveal! Projects come together like a dream in the $100 Room Challenge! If you are like me, it’s probably because you have a deadline ? your two projects looks so great! Can’t wait to see next week! 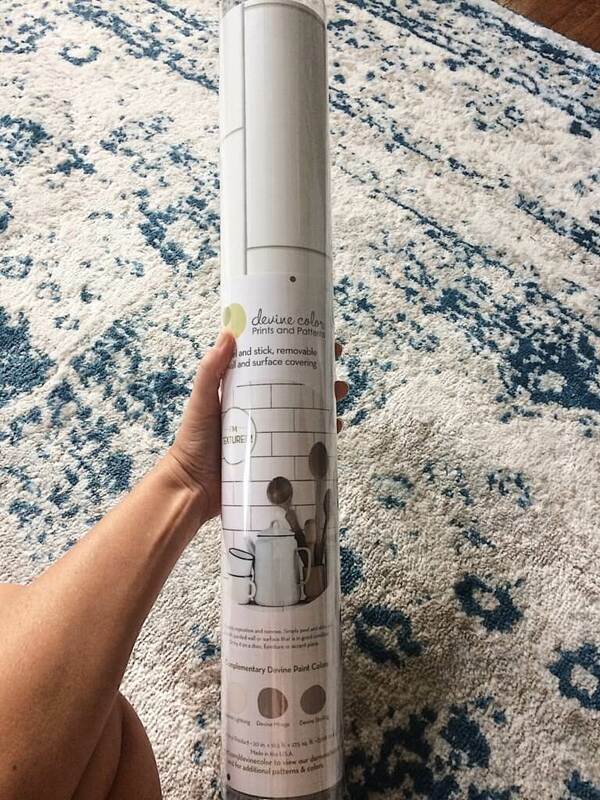 I wish you had step by step directions for the shelf because I simply love the idea but my husband is pretty challenged in the area of carpentry ? Aww I am too! I promise it’s just a matter of nailing the two boards together!! As easy as can be! I’m sure he could do it!!! ? I love that I’m not the only person in the world with my washer and dryer in my bathroom, I have the same side view! I’m currently repairing after flooding from Harvey, this will be first on my after repair list! Do you have a photo of the side w the 1′ side and the bracket? ! Not sure what you mean here and would love to do this! I made this. I ended up screwing the boards together and then using small L brackets for extra stability. I happened to have the exact same stain on hand from a bed I built. I’m so happy with how it turned out. No more worries about my kittens getting behind the washer and dryer. Thanks for the inspiration. Aww yay!!! SO glad it worked out for you!!! You’ll love it so much!!! Thank You so much, I know that even I can build this and how to .make it Wonderful9. What’s up every one, here every person is sharing such know-how, so it’s nice to read this website, and I used to pay a visit this weblog everyday.